Colored Hair Gel There are 11 products. Perfect your perfect party or riotous rave hairdo with your very own hair color gel! These bright hair color solutions are hassle and dedication-free and are sure to make you stand out on any dancefloor. These products gently color your hair and some hair gel products allow you to style as you add a dosage of awesome color to your locks. Unlike semi-permanent or permanent hair dye, a temporary colored hair dye will sit on top of your hair rather than entering deeper into your hair strand. This is perfect for a night of fancy dress or a festival. Enjoy having wild hair for 24 hours then jump in the shower and wash it all away. With hot water and some of your normal shampoo, you will be back to your normal color in no time at all. You may need to scrub your hair a little more vigorously than usual or apply an extra scoop of shampoo. If you have ever used normal styling gel before you will know that an extra wash can make all the difference in returning your hair to its usual silky self. 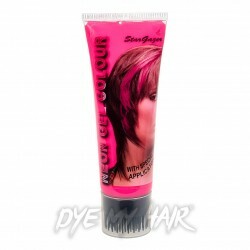 Once you have got your colored hair gel wash out you can return to work or school with natural hair. Temporary hair dye gel is a little different to temporary chalk because you don’t have to set it in the same way. Chalk works best if you wet your hair first and then dry or apply heat to the colored section. With colored gel, you can skip this process and simply apply it straight to your hair. Rub it in with your fingers and set it in your desired style and you will be ready to go! This is perfect for spur of the moment nights out and parties. It also comes in handy at a festival when you don’t have many hair accessories on hand. Create your own mini salon in your tent and have the whole gang brightened up with neon hair gel in no time. We also stock Paintglow’s Temporary Hair Streaks. 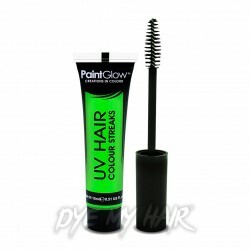 This gel mascara is very similar to gel; it just comes with a handy brush to help you apply your color hair. Run the brush over the strand of hair you wish to color and watch the color show through. When you are using a color hair gel you may want to wear a pair of gloves, especially if you are using your fingers to rub in the gel. This process can get quite messy and like any other dye could lead to staining. Hair gel won’t always work on dark hair colors however one trick we would like to share with you is to use a white hair gel first and then apply the color hair gel on top. This can help by giving you a lighter color to apply your neon or UV temporary colored hair gel to, therefore allowing the color to shine through more brightly. 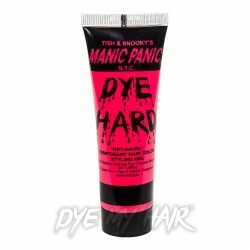 As we mentioned previously, we stock Paintglow’s temporary hair streaks. It comes in a few different bright UV colors so you can achieve a totally crazy new look. This hair mascara is perfect for crazy hair days, Halloween costumes and punk style streaks. If you are considering trying a new color but aren’t quite ready for a full semi-permanent hairstyle then why not try a temporary option? This can give you the chance to get used to seeing yourself in the mirror with a new shade and if you fall in love with your new look all you need to do is shop the semi-permanent range instead! 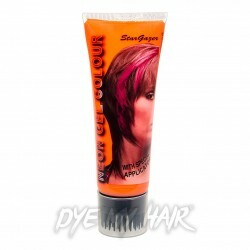 Another brand we stock is Stargazer hair color gel. Their range of UV hair gel is bright and vibrant and perfect for parties. It looks especially cool under UV lighting, producing a bright fluorescent glow. This makes it perfect for mixing and matching. Try different streaks in all your favourite colors and create cool designs for your hair. This can be extra fun for those of you who are sporting a buzz cut at the moment. With short hair, you can create all kinds of funky patterns! 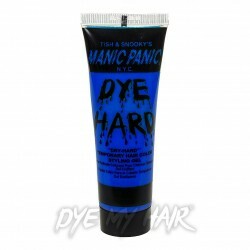 Last but certainly not least we have Manic Panic gel. All you Dye-Hards out there will know that this range has some fab colors to choose from. As well as neon colors you can also choose from dark Halloween inspired shades such as Vampire Red. Fancy trying Granny Gray but only for one day? Try Manic Panic’s Stiletto hair gel for a silver fox finish. These colors are sure to liven up any costume and are easy to apply. As you can see when it comes to colored hair gel it really is the perfect way to get a completely new color minus the hassle and commitment. Choose your favourite color or go wild and add a whole rainbow to your basket! With pocket money prices, you can just enjoy having fun with your look. If you have been searching for a colored hair gel UK stockist then you can stop right there and make Dye My Hair your one stop shop for all things hair dye! With every color imaginable and plenty of handy extra accessories, we will have you dyeing your hair like a pro in no time. Hate feeling like you are left alone once you have made your purchase? All you need to do is pop back to our page for plenty of tips and tricks in our blog. With new content on our social media channels every day, you are sure to feel like an expert by the end of your hair adventure.